I’ve never cared much for the hubalub of New Year’s Eve. The forced cheer wears me out. So, last week it was with vigor that I embraced a new sort of new year celebration. 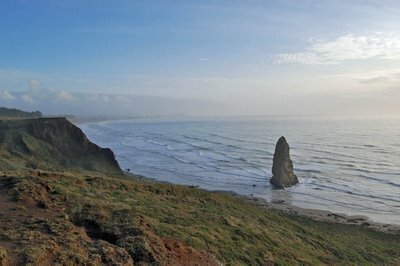 A small group of us drove three hours south along the Oregon Coast to arrive at Cape Blanco — the most western point of the contiguous U.S — where we watched the sun set on 2008. In essence, we were the first to see the last sunset. As the sun slipped in and out of a scattered winter haze, we sipped champagne, burned sage, sang songs, took photos, walked the lighthouse grounds, and recited bits of poetry and prose. It was the perfect marker of ends and beginnings -- and wonderfully free of false joy.